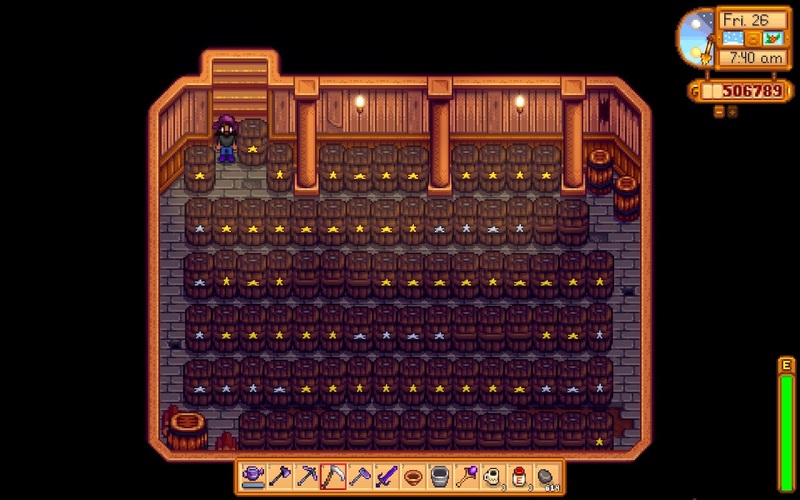 I mentioned in a recent post that I had been thoroughly engrossed in the game Stardew Valley. After five weeks and five virtual years in the valley, I put my current save file on hold, as I felt 201 hours of gameplay was a bit too much escapism. In some respects though, this experience has helped me reconnect with other real-life human beings, as forming relationships—both platonic and romantic—is a core feature of the game. 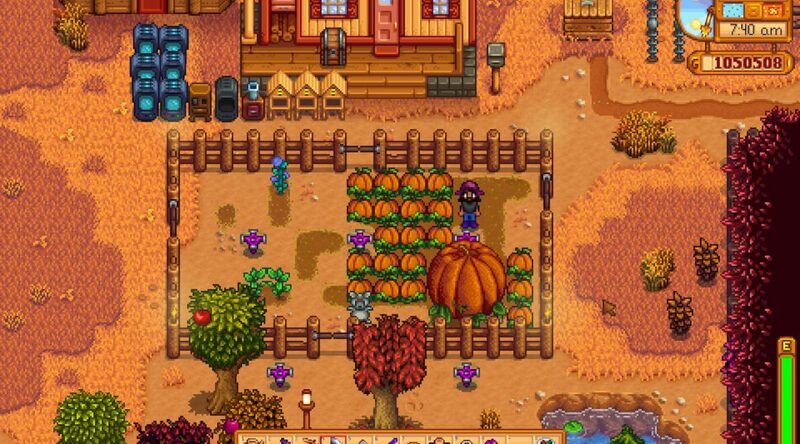 Farming crops is the feature that drew me to Stardew Valley, however. I had previously enjoyed playing Farmville, for reasons I explained in my post about my most popular Flickr photos, and I’ve done lots of gardening in The Sims as well. I’ve tried my hand at real-life gardening, but after three years of volunteer work I concluded that I have neither aptitude for nor enjoyment of this hobby, sadly. 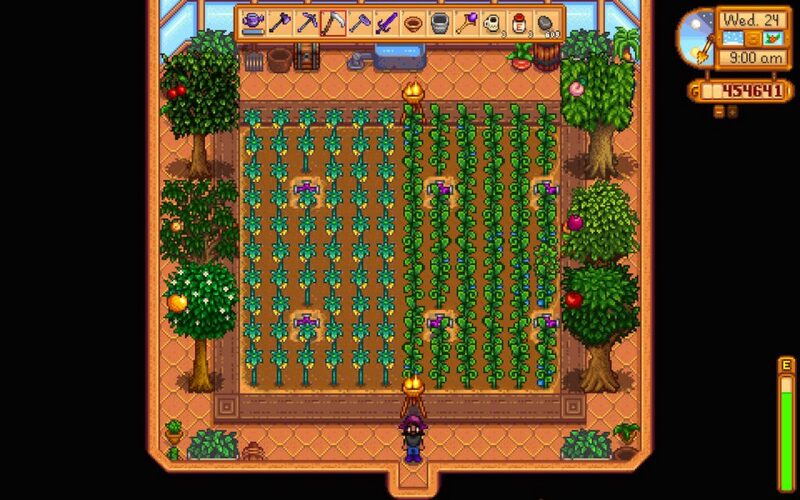 In this game, after struggling through learning the mechanics (which were quite different from other games I played), I turned to amassing a virtual fortune by making wine and jelly from the two highest-grossing crops, starfruit and ancient fruit. Having a shed full of kegs and a cellar full of casks is pretty amusing for a teetotaler like myself, but unlike animal products, I have no moral objection to alcohol. 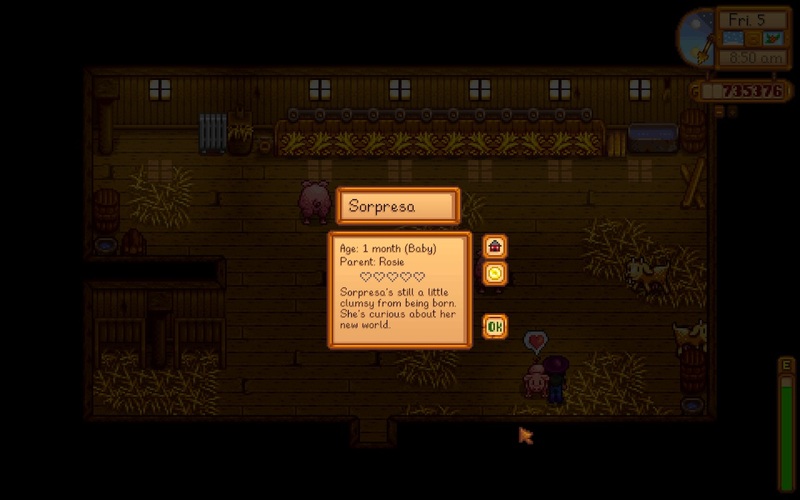 As a vegan playing a version of myself in this save file, I did not prepare or consume any dishes containing animal products. Even though it’s just a game, since becoming an activist (for human as well as animal rights), my pacifism has influenced my virtual activities. 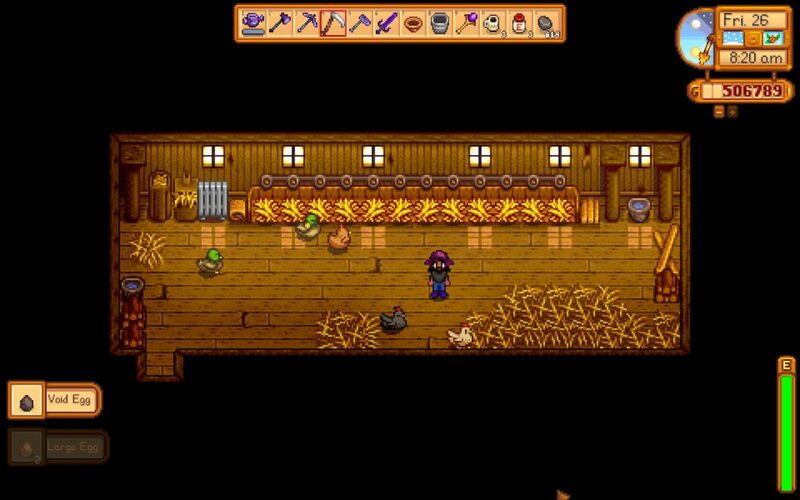 I did decide to share my farm with some animals as if i were running a sanctuary. In a real vegan animal sanctuary, however, the chickens’ eggs would be fed back to them, and the goats and cows would not produce milk unless they were pregnant. More importantly, on real farms, even free-range and backyard operations, the overwhelming majority of male chicks are killed shortly after hatching, and the overwhelming majority of egg- and milk-producing animals are killed once they are “spent”. 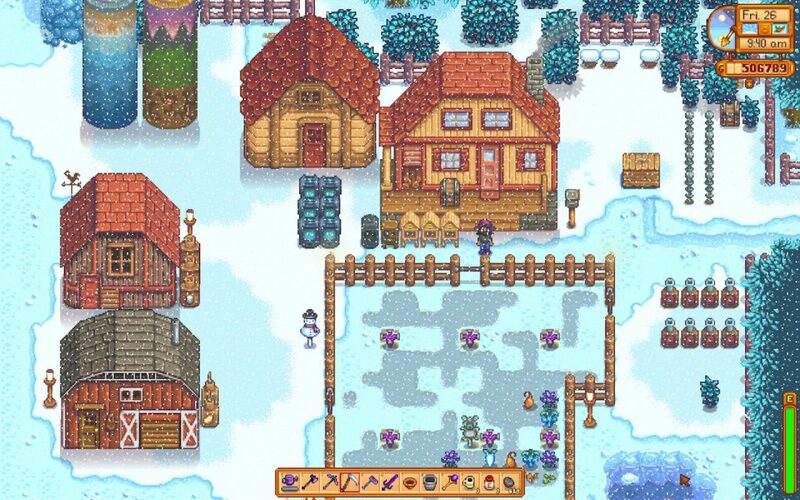 Peaceful Prairie Sanctuary has more detailed information on the “Humane Myth” which leads many (if not most) US-Americans to believe that idyllic settings like Stardew Valley, where farmed animals can live out their natural lifespans in comfort and happiness, could actually exist. I’m not blaming Barone for reinforcing these myths, I just want more people to be aware of them. Combat is another feature of the game, which is difficult to avoid if one is to make any progress in the mines, a rich source of gems and ores for crafting and upgrading equipment. I justified fighting with the rationalization that the enemies in the mines are hostile imaginary monsters, unlike the fishes who are just peacefully going about their lives when they are yanked out of the water. If and when I start a new game, I will likely choose the farm map that comes with a small mining area, so I can start that activity immediately without so much killing. Getting back to human relationships: This game is surprisingly deep in that regard. Dialogue with the villagers explores themes including alcoholism, post-traumatic stress disorder, and even suicide. I remember one moment in the game where I was elated that I acquired a needed item for the community center and was rushing to deposit it, when I suddenly got a cutscene with a character who was had passed out drunk and was seriously contemplating jumping off the edge of a cliff. This was a good wake-up call and reminder that the developer intended players to focus on issues beyond earning money and completing game milestones. Overall, I’m very happy with the Stardew Valley experience. It’s an incredibly detailed world, and particularly impressive considering one man, Eric Barone, created all of the art, music, dialogue, and every other aspect of the game. The animal farming and fishing aspects raise important ethical questions, but I would still not hesitate to recommend this game to others, including vegans. 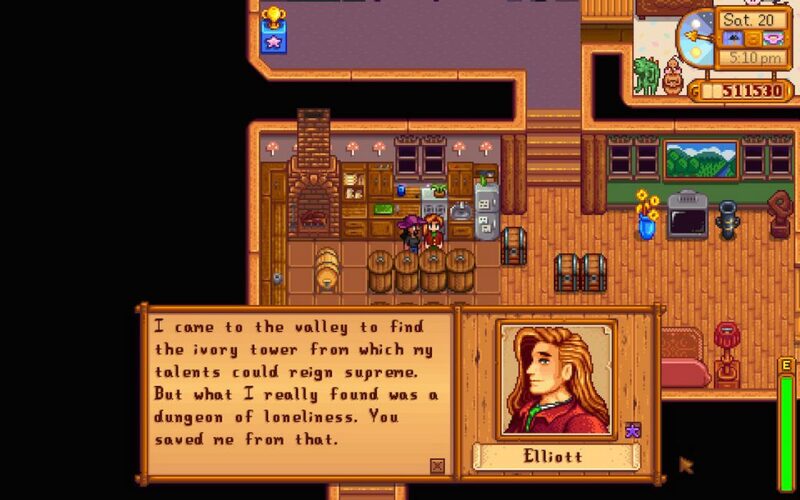 While I am now, slowly, attempting to spend more time outside of my apartment, socializing with others (I just rejoined the Lesbian/Gay Chorus of San Francisco after a three-year absence), I’m sure I will return to Stardew Valley for further adventures. ETA: You can now see more detailed information on my farm here.